Ahhh Name Badges. Can’t live without them, and they’re so hard to get right. We’ve all been up the night before, mail merging, and pre printing name badges. Only to then have to resort to the Sharpie solution for walk ins, and name corrections. With EventDay’s integration to EventBrite, those are pains of yesterday. This quick video tutorial, shows you how to setup EventDay to Sync tickets with EventBrite, and print name badges on Demand as your attendees arrive at your event. I’m Sorry, your name is not on the list. I love speaking at Events. It’s a passion I have to be on stage and both learn from the audience as well as share knowledge learned over the years. This situation just happened again to me recently, and in fact I’m myself guilty of this in the past at my own events. Staff: Hmm, I don’t see you here. Me: Try “C” or “K” sometimes my last name is spelled wrong? Staff: No, not on the list, did you register? Me: I’m a Speaker for tomorrow. Staff: (Puzzled Look) …. We don’t have …..
And you get the point of this post. Long story short … if your event is using Name Badges and Security Credentials, don’t forget to register your speakers. P.S. #EventProfs ProTip : Check with your presenters ahead of time if they plan on bringing a guest or spouse. It’s a nice VIP touch to have these credentials ready as well. If guests/spouse isn’t allowed, you should communicate that well in advance to avoid a potentially uncomfortable situation. It happens at nearly every conference. The organizer wants to impress the bosses, and as such the badge is designed highlighting the conference or a company that’s sponsoring. The badge probably looks very attractive on the table when attendees pick them up, but when they go to meet other attendees, speakers and exhibitors, they have a hard time doing what they’d expect to be able to do with others’ badges: read people’s names. At least the first name. Last name and company can usually be a little smaller, as we don’t think people greet each other by last name and “what company do you work for?” is a fantastic introductory question. Highlight that first name above all else. Unless the badges are sponsored, there is no good reason to have a large logo on them. None of the attendees need to be reminded where they are, and they probably take off the name badge when they leave the premises, so advertising the event is pointless. Leave some white space so others can focus on that important information on there. Any event that has vendors, presenters, attendees and any other distinct groups can use color coding to determine access or material type. For the people that run the event, choose bolder colors, as they’re easier to pick out in a crowd. For the attendees, lighter colors works, as they’re more inviting. 3-5 segments is probably the max, as too many will confuse you, too. No one likes a twisted name badge, even if the content is on each side. A better solution is to have two holes to secure the badge on top, even if it’s a little pricier. This also means you could put content useful to the person wearing the badge on the back, in a smaller font, and not have to worry about readability beyond a few inches. Also, room for sponsors. QR codes, RFID chips and NFC capabilities can provide extremely useful data to conference organizers and allow attendees easy access to information. Real-time crowd traffic flow, contact information sharing and even purchasing power can all be integrated. Anything we didn’t mention? 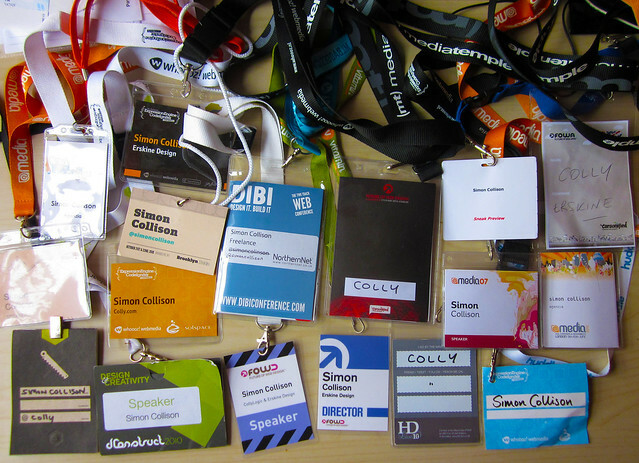 Are you usually happy with the name badges at events you host or attend? © 2010-2014 EventDay. All rights reserved.